Situated on the southeast corner of Fremont and Seventh streets, Downtown Container Park spans a mix of 30 shipping containers and 41 multi-functional modular cubes forming its perimeter; the hub for an assortment of small boutiques, galleries, bars, eateries and outdoor spaces as well as entertainment and education programming. Marking the entrance of Downtown Container Park is a 55-foot-tall steel praying mantis sculpture built atop a dump truck straight from the Burning Man festival held in the Black Rock Desert of Nevada. There are four other penny machines within 10/15 minute walking distance west on Fremont Street and one at the Mob Museum: see the Downtown Las Vegas locations. No Free Parking. The hotel casino parking garages charge different rates for hourly parking, most are $2.00 for an hour. 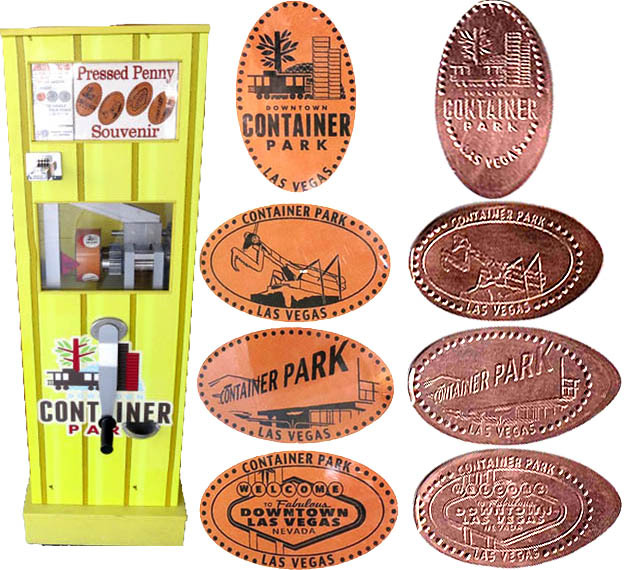 thegillion added Downtown Las Vegas - Container Park to system.